Kids, Cows and Grass: Open Mind. Open World. My daughter's trip to China for agriculture experience. Open Mind. Open World. 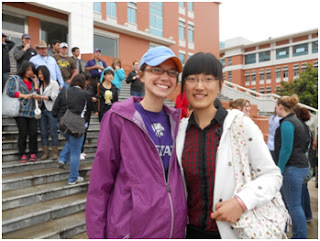 My daughter's trip to China for agriculture experience. These words greeted me from an advertisement in the Beijing airport. Although I didn’t know it at the time this phrase would encompass the challenge and opportunity presented by my trip in China. Through the Animal Science department at my university, I was selected along with 15 other students to study abroad in China for 12 days. The focus of our trip was Chinese agriculture. So in addition to touring the Great Wall, ancient gardens, and Tiananmen Square, we visited the people and places that grow China’s food. My first exposure to Chinese agriculture was seeing a man herd sheep alongside a bustling freeway. Although I wasn’t able to snap a photo of this scene, I do want to share these other shots that made a huge impression on me. 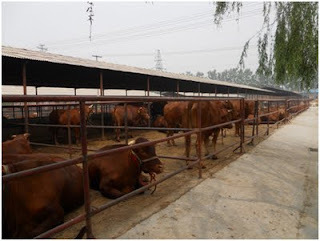 This beef feedlot is small to American standards holding approximately 1000 head. 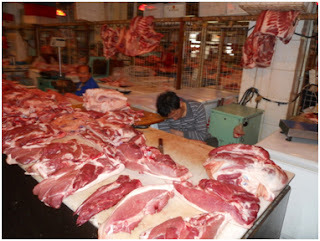 Chinese production methods are rooted in history and tradition resulting in small-scale farms. As the Chinese population grows, the question of feeding the Chinese people presents a huge opportunity for the American farmer in terms of imports and trade. I don’t know about you but a man sleeping on the meat counter seems a bit unsanitary. This wholesale meat market in Beijing was huge and room temperature (actually on the verge of hot.) Seeing these conditions made me appreciate our safe American food supply. My favorite stop throughout the trip was visiting Northwest A&F University in central China. This student, Lucy, was an animal science major and in addition to having a passion for agriculture we shared interests in American music and ice cream. All the students we met were very open and eager to share and learn about the United States. Having never been to another country, I expected America… what I got was China. China with its squatting toilets, fish served with head intact, large cities, and crazy drivers. China with its eager, proud people and innovative potential. As much as I learned about the Chinese history, culture, and agriculture industry, I learned just as much about myself and the passion that keeps me rooted to my core... I am a Kansas farm girl who loves a good steak, fresh, clean air, black cows on green prairie grass, and watching the sunset. Looks like we have another blogger in the family! Nicely done, Meghan! Was curious if you've chosen a major yet (no rush, just wondering)... is it Ag Science... or journalism? Thanks Dane! Glad you liked my post! My major is actually Agriculture Economics. Great post, Meghan. I don't know which is more disturbing, the meat counter or the fact that you are now a Junior at K-State! sounds like you enjoyed your visit. Makes you appreciate what we have here in the good ol' USA!